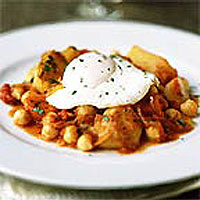 Cocida is a Spanish stew made with chickpeas or dried beans, vegetables and a little meat. This vegetarian version has a hint of chilli and cumin. Top with a poached egg and serve with garlic bread. Fry the potatoes in 2 tablespoons oil for 15 minutes or until cooked and crispy. Set aside. Pare the lemon rind and cut into thin strips, squeeze the lemon juice and set aside. Heat the remaining oil in a 28cm-wide pan over a medium-high heat. Stir in the lemon rind, chillies and cumin. Allow to sizzle for 30 seconds, then add the onion and shallots and cook for 5 minutes until the onions have softened. Add the carrots and swede and 300ml cold water. Bring to the boil, cover, then simmer for 15-20 minutes until tender, adding more water if necessary so that the vegetables do not dry out. Stir in the chickpeas and potatoes and bring to a simmer. Add the tomatoes and lemon juice, season to taste and cook for 5 minutes. Meanwhile, fill a large saucepan with water 6-10cm deep, add the vinegar, and bring to a simmer. Break the eggs and slip into the water. Poach for 3-4 minutes. Remove with a slotted spoon. Place on top of a serving of the cocida and garnish with chopped, fresh parsley.